Blues back Luke McAlister has confirmed he has signed a three-year deal with French Top 14 side Toulouse. The 27-year-old will head to France later this year having denied a deal had been done when announced by the European giants back in April. It will be McAlister's second stint in the northern hemisphere having spent two seasons with English Premiership side Sale Sharks between 2007 and 2009 before returning the New Zealand. "At the end of my Sale contract I returned home to be near my family. 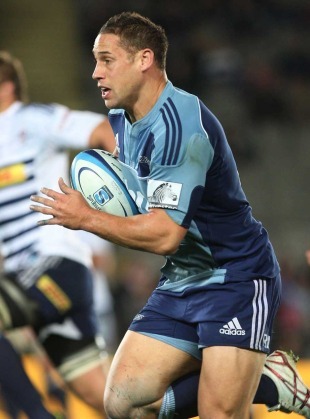 This year, I've really enjoyed my season with the Blues and I'm glad it's not over yet," McAlister said, whose side are still in the hint for Super Rugby glory. "Looking ahead, the opportunity to play French rugby and live in France with my partner and children will be something totally different to what we're all used to, but it will be an exciting new chapter in our lives." McAlister, who will be joined at Toulouse next season by Wallabies scrum-half Luke Burgess and Springbok prop Gurthro Steenkamp, has won 30 caps for the All Blacks since making his debut against the British & Irish Lions in 2005 but has not featured on the international stage since 2009.